The John Deere Z355E has a 22-hp V-twin engine with 44.2-cu inch displacement, allowing the machine to handle even the toughest of situations. Improved sound quality and fast starts provide comfort and convenience while cast-iron sleeves and rear engine guard ensure a longer engine life. This piece of equipment includes a service interval decal that provides basic maintenance information. Convenient mower deck access and easy engine servicing ensure the operator can spend less time on maintenance checks and more time fully enjoying their machine. Large front caster wheels and large rear drive wheels offer operators a smoother ride, comfort over uneven ground, better slope performance, and better traction. 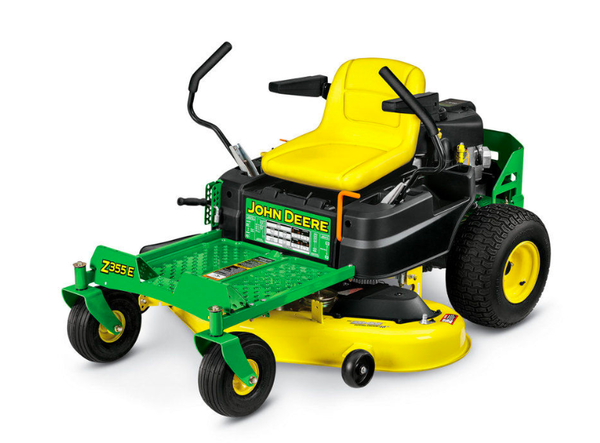 The design of the John Deere Z355E also provides benefits such as the ability to get on and off the mower easily, plenty of legroom, and control levers for height and position. The mower deck on this piece of equipment delivers outstanding quality, efficiency, durability, and versatility due to its stamped-steel, deep, flat-top design. Operators can be confident they are getting a quality cut the first time around and can enjoy other aspects of this feature, including MulchControl™ and the optional Power Flow Rear Bagger. If you have any questions about the John Deere Z355E, you can contact your local John Deere dealer.